Today was another long and busy day. We didn’t make it into our hotel until 8:30 again, but at least this time we had already had our dinner. We really pack a lot of stuff into every vacation, I have to say. It isn’t a vacation if you don’t go back home tired, right? Right? It was cold this morning when we woke up, which wasn’t really a surprise. We had to really be brave to go out into the wind for our run, but we managed. It was blowing so fiercely during our run that at times I thought it would knock me over. It certainly smacked me a good number of times with the hood of my running jacket. We made it back to the hotel room alive, though, and showered and packed our things. Breakfast was yogurt, date scones, and apple juice, though the yogurt and apple juice froze a little in the refrigerator. We set them in the window to thaw while we showered. The apple juice was still too frozen, so we just put it in the car for later, but we did manage to have some of what amounted to vanilla frozen yogurt for breakfast. It was actually a happy accident. I thought it was delicious that way. We briefly revisted the center part of Greymouth this morning to get some photos of the big breakwaters we visited on our run before heading further south along the coast. We could definitely see some white-capped mountains in the distance, promising some spectacular views as we continue south. Between Greymouth and Franz Josef Glacier, we didn’t stop much, aside from the occassional pull-off to take some nice photos. The weather was warming up, which was great. The cold day yesterday was unpleasant. Franz Josef Glacier, which is the name of the town as well as the glacier, is a cute little touristy town that’s filled with people taking helicopter tours and hiking trips to the nearby glaciers. It was perhaps the busiest town we’ve seen since we left Wellington. All of the restaurants were packed. It’s funny seeing all of the rental cars and camper vans. I wonder what the population of tourists to locals is, especially during the summer months, when they have the most visitors. The whole country only has 4.8 million people in it, which is slightly smaller than the population of Washington D.C. Only a little over a million of the Kiwis live on the South Island. I bet they are outnumbered sometimes. It was only around 11:45, but we figured we had better go ahead and grab our lunch, since we wouldn’t have much opportunity later on in the day. We ended up at another Indian restaurant, which wasn’t as busy as the other places in town. It wasn’t bad at all, though it wasn’t perfect. I can be very particular about my Indian food. Of course, I don’t ever seem to burn out on it, which is great since we’ve had it so much on this trip. I’m just glad we haven’t been drowning in veggie burgers or grilled cheeses. That done, we parked at the glacier’s trailedhead and took the half hour loop back to the glacier viewpoint. You could walk all the way to the foot of the glacier, but we weren’t prepared to do that, and hadn’t really planned to, so the viewpoint was a good compromise. On the way out, we ran into Mark’s colleague, Lauren, and her partner, Billy. Lauren was at the conference with Mark last week, and Billy came to New Zealand later on, like I did. They’ve been exploring the islands as well, and were even forced to drive some through the snow we’ve been hearing about, which can’t habve been fun. Could it be any prettier here? We were totally surprised to see them, since none of us had really expected to be in the same places at the same time. We swapped information about the places we’d been and chatted for a few minutes before we parted ways, Mark and I up the glacier, and Billy and Lauren back down. The walk to the glacier was easy enough, but by now it was getting quite warm, and the sun was out. We were almost hot by the time we made it back to the car. The glacier was lovely, and we managed some nice photos with the sun out and shining for us. After Franz Josef Glacier, we continued to make our way toward Queenstown until we arrived at our second glacier, Fox Glacier, which was partially closed due to a recent flood. Luckily the walk to the lookout was not closed, and we took another 20 minute walk out to take some photos of Fox Glacier. I can’t say for sure that one was better than the other, as they are pretty similar in my mind. They are of a similar shape and size, and the location for each is in a simlar valley. Regardless, glaciers are cool and I’m glad to see them with ice still in them, unlike the ones in Glacier National Park back home. Those glaciers are almost gone. You can see where these have retreated, even in the photos. It makes me sad to think about it. The flooding thing is interesting. We’ve been seeing a lot of water moving around today, and I think it is because of the recent snow. The snow fell, but it is generally warm, so I’m guessing that the new snow is now melting, and sending all of the water that fell on the mountains down to the valleys where we are doing most of our driving. I have no way to know for sure, but that’s my theory. There’s also no way to know for sure if that was the cause of the flooding that closed the hike back to Fox Glacier. Mark and I had actually assumed it was still snowy, but now that I really think about it, they’d probably let you hike back to the glacier in the snow, if you wanter. The snow isn’t dangerous if you are prepared, where the flood water would be. You’d also risk damaging the trails and such hiking on muddy paths. Either way, I’m glad it was clear enough for us to the see the glaciers today. If you are curious, the town at the base of Fox Glacier is also, coincidentally, called Fox Glacier. Sounds original, right? I just can’t imagine why it was so hard to come up with something else. Maybe the towns just sprung up at the base of the glaciers because of tourism, and nobody ever bothered to give them a name? After Fox Glacier, we were mostly done with our major stops for the day. We had already spent a good portion of it wandering around, so by then it was time to start making miles. Making miles in New Zealand is hard, first because the speed limit is slow and tourists in buses that can’t go very fast clog the roads, but also because around every corner there’s some new awesome view to stop and photograph. If we stopped everywhere we wanted, we would be here for a year, I swear. After the glaciers, the road to Queenstown dips back into the island away from the ocean and past several large lakes. 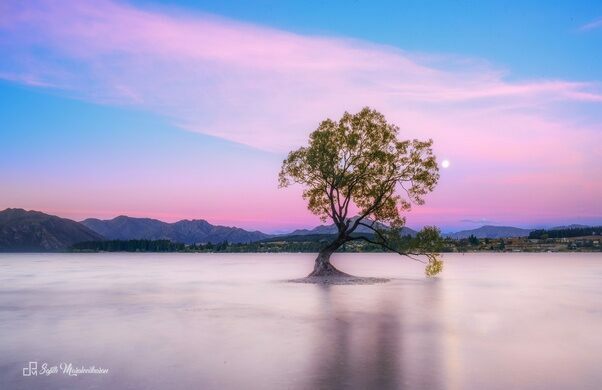 There’s a town called Wanaka there, and the town is famous on social media for a small tree that grows in the middle of the lake. Well, I say that, but really it grows kind of close to shore and isn’t nearly as impressive as people try to make it look in photos. When we arrived in Wanaka, we drove over to take a look at the thing, because how could we not, when it is a somewhat famous internet meme? The tree looks like this, but is photographed like this. Isn’t that a little silly? We didn’t bother to get out for a photo, since it was raining. 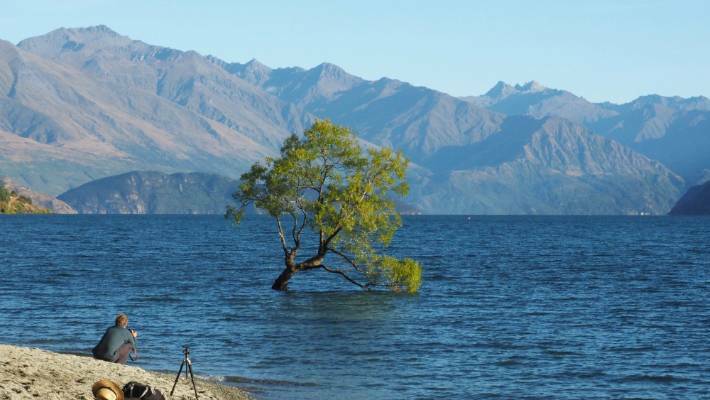 Also, when I was looking for those pictures, I discovered that tourists are apparently killing the tree by wading out to climb on it like jerks, which is not that surprising, I guess. This is why we can’t have nice things, people. Nice, ridiculous things, but still. We also got our dinner in Wanaka. The town was very busy, and it was difficult to park. We tried the grocery store for dinner first, since it would’ve been fastest, we thought, but it was very busy and waiting in line would’ve taken forever. Instead, we ended up walking over to a little food truck row and picking up two individual-sized pizzas. It was two for one day, so we had the cheapest meal so far on our trip. The pizza was fine. Mark’s was a little heavy on the mushrooms, and my margherita pizza was a little greasy, but we made do. The food trucks didn’t offer water with our meals, and we had finished our giant bottle of water about an hour earlier, so we had to stop a little later for drinks. This time we had a lemon, lime, and bitters Bundaberg soda. Apparently bitters are a brewed blend of herbs and spices. I had no idea. This stuff smells awful, but actually tastes quite nice. This soda smells terrible, but is actually delicious. We made it to Queenstown around 8:30, which is a little later that we would’ve liked, but we are here for two nights, so it will be nice not to have to pack our bags and run out the door in the morning. Tomorrow we drive over to Milford Sound, which should be a lot of fun. It looks like it will be even warmer then. Yay for weather that actually resembles spring! We’ve also got a run planned around Queenstown first thing. This town is absolutely gorgeous, so I’m looking forward to our picturesque run along the edge of their lake. Looks like you guys are having a good visit. Your photos remind me of all the beautiful places we saw while there about 30 years ago. Look forward to your Milford Sound photos.